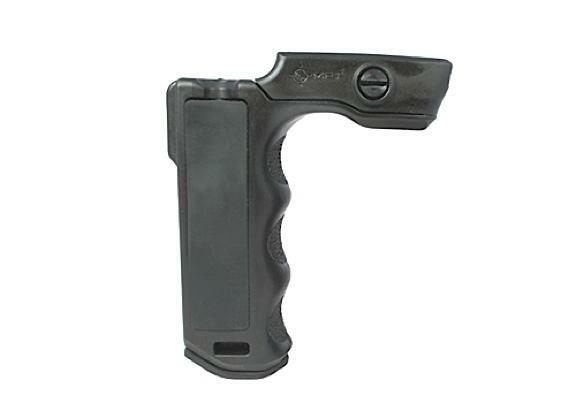 The React Magwell Grip (RMG) is a compact textured vertical grip designed for close hand hold application at the low ready or CQB situations. Designed to provide a positive grip surface with wet or gloved hands. Locates support hand forward of the magazine well to prevent injury should an overcharged round cause the ejection of the magazine. This grip also incorporates right and left handed pressure pad wells for wired switches and a spare battery storage compartment. This grip allows the support hand to apply rearward pressure keeping the weapon shouldered, yielding better muzzle control and accuracy. This is the grip you want if your objective is a close hold grip with added safety.